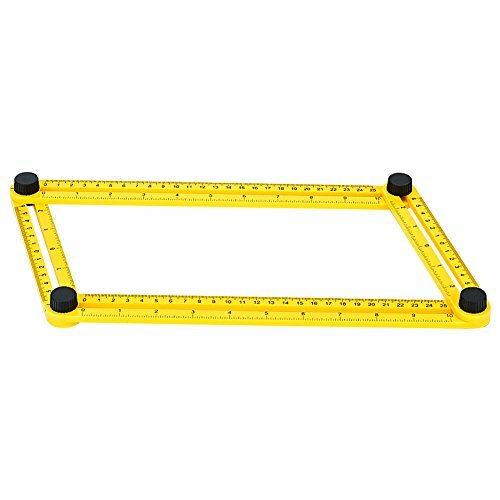 The Most Versatile Angle Ruler For Accurate Measurements! Are you a weekend warrior that love DIY projects? Always faced with complicated angles that cannot be replicated or measured with a regular ruler? Do you want to measure awkward angles easily and precisely? Well, the GYMAN template tool is exactly what you have been looking for! What are you waiting for? User Friendly! The best thing about this ruler is that everybody can use it! Just place the angle-izer template tool onto your work area, slide the rulers into the shape needed, and tighten the screws. Which can lock into any desired angle as a reusable stencil for endless applications. Portable and lightweight! Whether you are a professional craftsman, you will operate it easy. Super Easy To Use: Just place the angle-izer onto your work surface, slide the rulers into the shape needed , and tighten the screws. Which can lock into any desired angle as a reusable stencil for endless applications. The Best Template Tool in The Market: Whatever angle you want measured, our angle-izer template tool is your best work partner, you can slide any side of the ruler freely to measure some irregular graphics precisely. It gives you precise and accurate angle measurements. Works on Any Materials :The GYMAN measure ruler can be applied for different material, such tile, brick, stone, lumber, laminate and more as you need! Save Money and Effort & Increase Efficient : This angle ruler folds for easy storage. With this measuring ruler you definitely can save money from less raw material wasting. The four-sided ruler mechanism slides and locks into any desired angle as a reusable stencil for endless applications, the increase of efficient will be as promised! 100% Free After-Sales Guaranteed: Top quality assurance! 100% money back guarantee if you are not satisfied! If you have any questions about this product by GYMAN, contact us by completing and submitting the form below. If you are looking for a specif part number, please include it with your message.